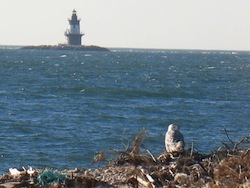 There were snowy owls spotted from Orient to Jessups Neck. There were bald eagles all over the Peconic Bay. A rare rufous hummingbird made its way to a backyard birdfeeder in Southold. And Arctic harlequin ducks were happily swimming in Long Island waters. This year has provided more glimpses of rare birds than any of the 110 years since volunteer birders began taking to the fields and the woods for the Orient Christmas Bird Count, which was started by Roy Latham on the North Fork in 1904, says MaryLaura Lamont, who has been compiling the count for 25 years. “There were an incredible amount of rare birds, including ‘count birds,’ which have never been seen on this count before,” she said this week after she finished compiling the results of the Dec. 28, 2013 count. The North Fork’s National Audubon Society-sponsored count is the oldest continuous count on Long Island, and it provides “excellent, excellent history,” said Ms. Lamont. All of the Audubon Society’s counts have covered a 15 mile diameter area since the count was standardized in the 1960s. Her Orient Count covers an area from Peconic to Plum Island, all of Shelter Island, Jessup’s Neck, North Haven and Sag Harbor Village. Snowy owls have been all over the East End all winter, due to a stellar breeding year in the Arctic, fostered by a good crop of their primary food source: lemmings. A snowy owl can eat about 2,000 lemmings each year. The so-called “irruption” in the snowy owl population has led many of the owls to fly south in search of more ample food supplies this winter, said Ms. Lamont. Ms. Lamont said birders on her count saw two snowy owls on Plum Island, two in Orient and one on Jessup’s Neck in the Morton National Wildlife Refuge. She added that snowy owls have become so prevalent on the East End that photographers are beginning to make their lives difficult here. Ms. Lamont said birder Richard Willott in Southold has had numerous sightings of a rufous hummingbird, a western species that until recently was never seen on the East Coast. Mr. Willott has been heating up nectar dishes since last week’s cold snap to help keep the hummingbird alive through the cold winter. Ms. Lamont said six separate birding parties on her count saw a total of nine bald eagles, though she believes some of those may have been the same birds. Ms. Lamont said high numbers of birds on any count has a lot to do with food supplies. The number of birds counted can also depend on the weather’s impact on visibility. This year’s count was on a balmy, sunny day where temperatures rose to nearly 50 degrees. Ms. Lamont said some of the changes are climate related. North Fork Audubon is now getting ready for the annual Great Backyard Bird Count, to be held Feb. 14 through 17. More information is online here.